First Chief Justice of N.C. Supreme Court, 1819-1829; author of numerous legal works. Grave is 1/2 mi. E. Home is 1 mi. S.W. John Louis Taylor, North Carolina Supreme Court chief justice, was born in 1769 in London. At the age of twelve, Taylor and an older brother, James, immigrated to Virginia. Taylor eventually attended William and Mary College, but was unable to complete his studies due to financial problems. He moved to Fayetteville, where he was admitted to the bar in 1788 at the age of 19. 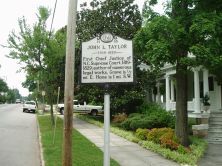 Taylor practiced law in Fayetteville and was appointed to the General Assembly in 1790. Five years later he failed in an effort to become North Carolina’s attorney general. In 1798 the Assembly appointed him a judge of the superior courts. By that time he had moved to New Bern. For the following two decades he served as a judge, and in 1811 was appointed by all other state superior court judges as their “chief justice.” Accordingly he sold his New Bern properties and moved to Raleigh where he built his residence, “Elmwood in 1813. 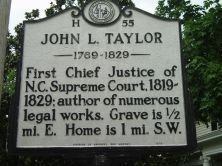 When the North Carolina Supreme Court was officially established in 1818, Taylor was elected its first chief justice. Three years later he opened a private law school at his home. Although not a college graduate, he served as a trustee for the University of North Carolina from 1793 until 1818, and was awarded an honorary law degree by Georgetown University.